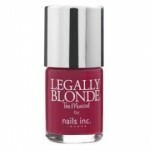 In celebration of the new Legally Blonde Musical hitting the West End, Nails Inc have created this gorgeous hot pink shade. It is the perfect colour to spice up any dull january day and it will hopefully instil a little of Elle’s infinite wisdom upon you! Whilst on the subject of nails, Nails Inc have also just released a very on trend Matte Black. If you are snoring at how old news you think black is, wake up! Because this polish has a very different finish to a normal nail polish. The matte effect will have you rubbing shoulders with fashion royalty faster than quick drying nail polish. Oxford Street matte black goes on glossy but dries matte and word of warning, do not apply a shiny top coat!